The compass jellyfish (Chrysaora hysoscella) has a distinctive appearance, including the colorful bands on its bell that give this jellyfish its name. 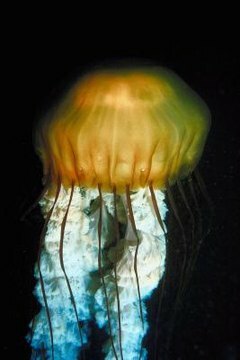 These jellyfish also have long, trailing tentacles, which can provide a painful, but rarely dangerous, sting. They live across a number of cold and temperate areas of the Atlantic Ocean. Compass jellyfish live in cold and temperate waters. Their habitat includes open water in northern and extremely southern regions. They can live in water from 25 to 82 degrees Fahrenheit. Usually they live near the surface of the ocean. However, they may "dive" as deep as 90 feet when seas get rough. They are very rarely found more than 100 feet below the surface of the ocean. Compass jellyfish have a wide geographic range. They are found in many cold and temperate areas of the Atlantic Ocean. They are commonly found in the northern part of the Atlantic Ocean near the British Isles, particularly the Celtic, Irish, and North Seas. Populations also exist in the Mediterranean Sea near Turkey. The compass jellyfish is also known to live off the western coast of South Africa. Compass jellyfish have a complex life cycle, and are most common from May to September. The swimming stage most people think of when they think of jellyfish is called the medusa stage. At this stage the animal reproduces sexually, producing tiny swimming larva called planulae, which settle and form a polyp or scyphistoma. The polyp resembles a tiny sea anemone. The polyp releases tiny ephyrae, immature medusa which grow into the adults during the summer. Toward the middle to end of the summer, most of the adults die off through strandings on the beach. The entire life cycle takes about a year. A species range can be characterized by "biogeographic" regions. These regions have distinct climates and ecosystems. In the case of seas, they are often grouped with nearby continents. The biogeographic range of the compass jellyfish includes the Palearctic and Ethiopian biogeographic regions. The Paleartic region includes the northernmost part of the planet. On land, it is characterized by tundra and colder climates. The Ethiopian biogeographic region refers to all of sub-Saharan Africa, including the waters off its coast.